I am in the middle of restoring this drill press to an acceptable viewing condition. This was purchased by my father at a tool auction and given to me for the start of my woodworking shop. It was an ugly beat up shade of green and had three layers of paint all together. The drill press is in excellent working condition all bearing and bushings are solid so I thought it would really be nice to make it look good again. I was wondering if anyone could provide model information about the piece and perhaps time frame as to when they were made. It looks similar to the Delta 11-100 but it is distinctly different. I have no history on the machine so it could be cobbled out of multiple pieces. The head of this one can rotate better than 90 degrees right or left and can also be slid in or out to accomodate different drilling needs. Any information that could be provided would be greatly appreciated, I am really happy with the way this machine is turning out. Not shown, it does have what appears to be the original rockwell motor, model 62-413 one third hp 1725 rpm. Hi Chad. 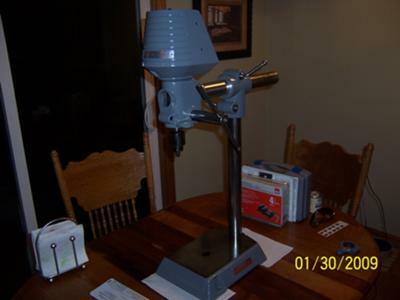 Your drill press appears all original; no pics of the table & the motor & mount. I've a late '40's version, without the horizontal tube; IE the quill casting is directly mounted to the vertical tube & therefore is not angle-adjustable. Mine has a "mushroom" style belt guard (It tapers to a point at the top.) & the base is shaped like looking at the rear of a small boat. (It also comes to a point at the back.) The front nameplate has HOMECRAFT in deco font, followed by the Rockwell lower case "r" logo in a wreath. (They revived that logo many years later) Below all this is written in small black print "DELTA DIVISION OF ROCKWELL". From what I've seen/read, Homecraft was a separate Company that Rockwell bought sometime in the '40's, & put their name with Homecraft... I "think" that our presses were a Rockwell design, & not something carried over from the original Homecraft Company; but I dunno for certain. Yours looks to be from the early/mid '50s; later models had an enclosed drive belt for safety. If yours has a bronze bushing for the quill shaft & oil holes accessible when the quill is all the way down (Like when drilling a really deep hole. )& a small, ball thrust bearing, it is definitely an older model. Your style press W/ the horizontal cross tube was made for decades; I guess Rockwell saw no reason to re-engineer the basic castings. Belt guards & all sorts of "safety" stuff appeared on later versions, as with all power tools. Something to keep in mind is lubing the grooves in the quill shaft, where they pass thru the front pulley; shaft is steel; the pulley & it's 2 (Modern presses use a spline) cast-in keys are of softer metal. (Aluminum, or sometimes "pot" metal.) you do not want to wear these out; parts are impossible to find unless you buy a whole nother machine to part-out; & never use a larger motor & try to Bull your way thru drilling something. Best of luck with your "resto"...It's way better than the cheap China stuff these days!